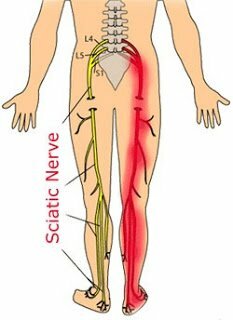 Sciatic Nerve Pain? What are Sciatica Symptoms? If any of you have every had the misfortune of suffering from sciatica as I have, then you know how debilitating and chronic it can be. Twice I have experienced the pain of sciatica, and take it from me, it can be as difficult to treat as it is to endure. Sciatica is nerve pain that travels down the buttocks, often to the upper hamstring and sometimes all the way to the bottom of the foot. Due to the size of the nerve and the pathway it follows, the pain can be felt as numbness, tingling, electric shock or even achy like a cavity in a tooth. And in some cases, it can vary between all of these symptoms. There are several causes of sciatica, but all involve inflammation of the nerve. The problem most people run into when treating sciatica is misdiagnosis. Most health care professionals misdiagnose the cause of sciatica either because they don’t understand the nature of musculoskeletal disorders or they never bother to put their hands on you when they are diagnosing. **PLEASE! Make sure your doctor or other healthcare professional puts their hands on the problem area. They cannot properly diagnose this condition with history alone. And above all, don’t fool yourself into thinking medication is the answer you have been looking for. It will reduce the inflammation temporarily, but it will not fix the cause of the inflammation. 4. Degeneration of the spine creating narrowing in the canal around the nerve. **Remember! Your Doctor of Chiropractic is not only an expert in bone and joint, but also soft tissue such as muscle. Your first line of defense is to see your Chiropractor, so that you can be thoroughly examined and the proper treatment protocol can be recommended. Based on the diagnosis, your Chiropractor may treat you or refer you to a specialist who can. If you can’t get to your chiropractor right away, an easy but effective stretch can help ease some of the pain. Lay on your back and place the foot of the painful leg on top of the opposite knee. Bring the non-painful leg in towards your chest (Important: If this is too difficult, loop a towel behind the non-painful knee, and use it to pull your leg to your chest, instead of using your hands). Bring that leg as close to your chest as you can. You should feel a stretch in the back of the painful leg and gluteal muscles. Hold the stretch for 15 seconds and repeat several times while working up to 60 seconds. The longer you hold a stretch, the better. Switch legs, repeat. Always remember to stretch both sides of the body. Don’t use this stretch if you are pregnant and suffering from sciatic pain. Instead, seek out a chiropractor or massage therapist in your area that specializes in pregnancy. Give us a call at Glenmore Chiropractic. We have great Chiropractors and massage therapists ready to help you and remember, it doesn’t cost a penny to sit down with one of us and talk about your injury.